Azulene, a major active chemical in chamomile, an excellent anti-inflammatory agent. Chamomile is a well known and safe oil for use in children. Chamomile oil relieves pain, and helps skin heal from burns, rashes and inflammatory conditions such as eczema. Inhaling the essential oil of chamomile lowers stress and helps to counteract allergies and insomnia, which are often factors in anxiety and attention deficit disorder (ADD). Herbalists especially recommend it for sleeplessness in children. Bisabolol and chamazule, are powerful antiseptics. Chamomile is an excellent remedy for all manner of women's disorders and is especially valuable for problems arising from stress, anxiety, and tension. Beautiful skin and hair: Chamomile creams contain compounds, that are antibacterial and anti-inflammatory- one of these, the lovely blue chamazulene, is noted for promoting tissue regeneration. The anti-inflammatory effect of the essential oil applied topically improves skin regeneration and a cold compress does wonders for puffy eyes. Chamomile is one of the safest herbs but some people are allergic to this and any member of the ragweed family. Respiratory problems: Eucalyptus essential oil is effective for treating a number of respiratory problems including cold, cough, runny nose, sore throat, asthma, nasal congestion, bronchitis and sinusitis. 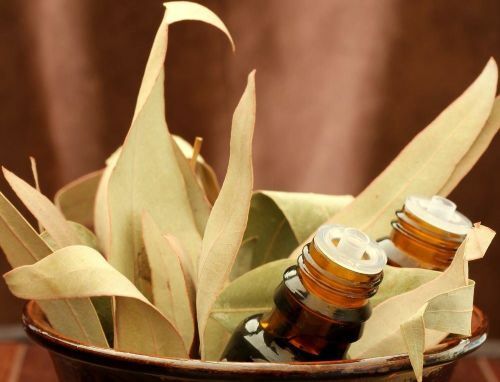 Eucalyptus oil is antibacterial, antifungal, antimicrobial, antiviral, anti-inflammatory and decongestant in nature, which makes it a good ingredient in many medicines that treat respiratory problems. A study published in Laryngoscope in 2004 shows its usefulness in treating non-bacterial sinusitis. Patients suffering from non-bacterial sinusitis showed faster improvement when given medicine containing eucalyptus oil. Gargles of eucalyptus oil mixed with warm water are consistently effective in treating sore throats. Diabetes: When ingested, eucalyptus oil can help control blood sugar. Its properties as a vasodilator, mentioned above, mean that the entire body benefits from the increase in blood circulation. Diabetic patients commonly suffer from lack of good circulation, and it can be very dangerous, even resulting in amputation or death. Therefore, it is a good idea to frequently massage eucalyptus oil onto the skin topically, and also inhale it as a vapor to ease the constriction of the blood vessels. For best results, massage it onto the skin after a show, which also has vasodilating and relaxing qualities that will benefit diabetics. Supplements containing boswellic acids combined with glucosamine are often used to relieve the joint pain and reduce inflammation in all types of arthritis . Boswellia or Indian frankincense is one of the Ayurvedic gum resins which are referred to collectively as guggals. The gum resin extract has anti-inflammatory and analgesic properties. Boswellic acids work differently than OTC and prescription pain relievers; they deactivate the hormonal triggers for inflammation and pain related and work along the same biochemical pathways affected by glucosamine. Boswellia extracts do not seem to work as fast, or be as potent as NSAID's, at least in my personal experience, but they are potent anti-inflammatories and can be taken long term without any appreciable side effects. 1, 2 For those with chronic, long term pain who also suffer from high blood pressure, heart disease, or gastritis alternative pain relievers like boswellia are doubly important.Frankincense oil is distilled from the gum resin that oozes from incisions made in the bark of the trees. The oil is often used in massage blends for pain for its analgesic properties. Frankincense has a profound calming and grounding effect on the emotions, which can be just as important as the physical aspects of dealing with chronic pain. Lavender essential oil is steam distilled from the flowering tops of the plant. It is clear or pale yellow in color, and has a distinct floral and herbaceous aroma that is sweet and clean. Lavender essential oil is amazing in its extensive positive benefits that effect the mind, spirit, body, and even your home. No doubt, it is deserving of the name it has earned of being the most versatile of all essential oils. Whether you use it for medicinal purposes, for its known relaxing properties, or for it's distinct floral scent, it is the one oil that I would place first in any collection for aromatherapy. It is an extremely useful essential oil and although powerful in its beneficial properties, it is one of the few essential oils that is gentle enough to apply directly on the skin. Lavender is an analgesic, antibacterial, anti-inflammatory, and antiseptic, to name a few properties. It's applications are numerous, and is used for many skin problems, stress related conditions, muscular pain, and is even an insecticide. To help alleviate headaches, apply a few drops to the temples.It is frequently used where a pleasant scent is wanted such as in baths, perfume oils, room sprays, sachets and skin lotions. But since it is a gentle to the skin, it can be used in any skin care, as it has healing powers powerful enough to help heal burned skin. Hyssop essential oil is steam distilled from the flowering plant. It has a pale, golden yellow color and its aroma is richly herbaceous and camphoraceous. Hyssop essential oil is antiviral and antibacterial. It is known to be helpful for the respiratory system and is an effective decongestant. It is also helpful in stress related conditions. It is good to use in a diffuser or diluted in a vapor rub during cold and flu season. For cold sores, antiviral lip balm. Because it contains ketones (pinocamphone), although in infinitesimal quantities, the essence is toxic in high doses, causing epileptic attacks in those predisposed to them. Not for use in pregnancy. Peppermint essential oil has a hot minty, menthol aroma that is quite powerful and can penetrate right through to the sinuses when breathed in. It is steam distilled from the flowering plant. Peppermint is widely known as a comfort for stomach and digestive problems, and for it's soothing, cooling action that comes from its high level of menthol. It has analgesic and anti-inflammatory properties that also contributes to it being such a popular mint in medicinal formulas. The essential oil, however, should be used externally, and there are still many uses for it. Use it in massage oils or balms to stimulate and relieve pain. I find it irreplaceable in homemade mouthwash that is pure, effective and so refreshing. Lemongrass essential oil has the aroma you would expect from its name. Its scent is not just lemony but also grassy, with a bit of an earthy straw undertone. The essential oil is steam distilled from the grass. It lowers fevers, cools the body, and helps circulation. It is also used in skincare applications, being antiseptic, astringent, and antifungal. It is especially good for oily skin and skin with acne. Use it in a spray mist as an insect repellent instead of citronella, or in your pet's shampoo to discourage fleas. It makes a good companion in the bath or body oil to serve as a balancing agent. Reduces skin wrinkling and aging. For ages people have used natural solutions to treat aging skin. It's said that Cleopatra bathed in milk to soften and enhance her skin. In the modern day, oil derived from the pomegranate fruit appears to have some potential for enhancing the appearance of aging skin. This ancient fruit, native to Southeastern Asia, is being studied for its role in reducing the signs of skin aging. Although all parts of the pomegranate plant appear to have beneficial effects on the skin, including the leaves, seed, and peel; the oil is emerging as a key player when it comes to slowing down the effects of skin aging. Journal of Ethnopharmacology. Pomegranate oil, derived from the seed of the plant, appears to cause changes in the outer layers of the skin that may help to reduce skin wrinkling and aging. A study published in the Journal of Ethnopharmacology showed that pomegranate oil stimulates keratinocytes, the major cells found in the epidermis, the outer layer of the skin. It appears that pomegranate seed oil may help to regenerate these cells and, in turn, offset the appearance of aging skin. Rosemary is such an extremely useful herb, with so many culinary, medicinal and aromatherapy attributes that it is hard to qualify which ones are the most important. Rosemary stimulates the central nervous system and circulation making it beneficial for low blood pressure and sluggishness. Rosemary oil and rosemary essential oil are used to alleviate the pain of sprains, arthritis, sciatica and neuralgia. Rosemary extract (rosmarinic acid) is a natural way to stabilize and extend the shelf life of hand made cosmetics, creams, lotions, and other herbal compounds. Use rosemary in skin care to tone and soften skin. Rosemary for memory, concentration and focus. Rosemary has a long herbal tradition as a herb that improves concentration and memory, Greek students would braid Rosemary into their hair to help them with their exams. Modern science attributes much of rosemary's action on the central nervous system to it's potent antioxidant, rosmarinic acid. However, you don't have to take their word for it, the uplifting aroma of a fresh sprig of rosemary in the summer will go far to convince you. Rosemary for pain relief and circulation. Rosemary infused oil and rosemary essential oil are both used in massage oil formulations to relieve the pain of arthritis and of sore aching muscles. Rosemary used as a massage oil also helps to tone the circulatory system. Antioxidant compounds in rosemary prevent uterine spasms and menstrual cramps. Rosemary essential oil helps alleviate water retention and increases circulation when used in massage blends.